LivePlan makes forecasting for your business easy. QuickBooks Online makes day-to-day accounting easy. If you combine these tools, you get something even better—the ability to see exactly how your business is performing against the goals set out in your forecast. Armed with that information, you can catch problems early and make smart choices for growth. 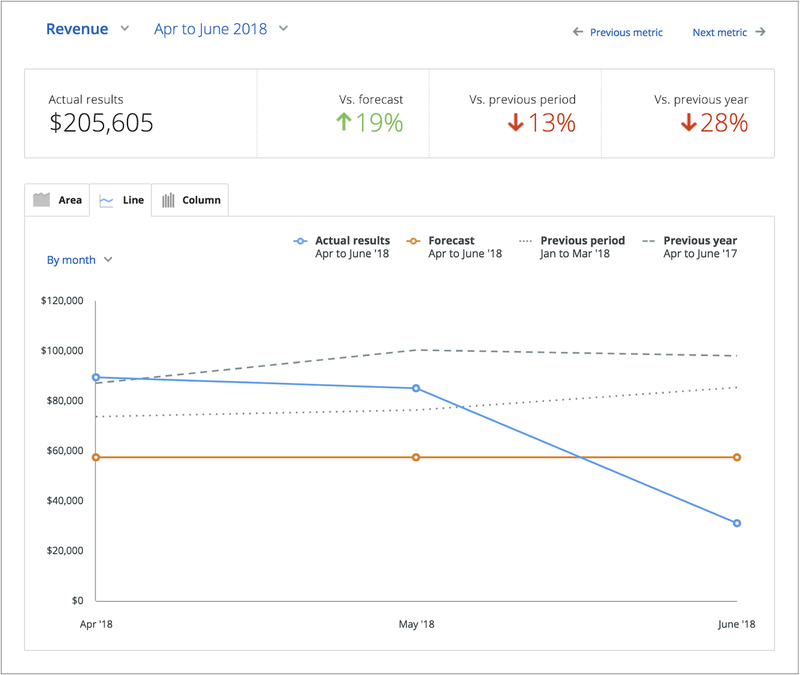 If you have at least a few months of actuals in your QBO account, then LivePlan can go a step further, and use those actuals to build a starting point for your forecast. You’ll make some updates to create a strategic forecast quickly. LivePlan will import new actuals automatically each day, or you can update the sync with QBO manually at any time. That way, you’re always looking at the most current picture. And with your forecast and actuals in place, your LivePlan Dashboard is ready to do some powerful comparisons. Why is comparing your actual results to your forecast so important? Let’s say you originally wrote your business plan for a specific reason: getting a loan, bringing in a partner, getting a credit line, or pitching to investors. Your plan helped you reach that goal, and now you are running your business. Congratulations! Full steam ahead. Now you don’t need that old plan anymore, right? Wrong. A plan isn’t just something you check off your to-do list and forget. Your business plan should be a living document that you revisit regularly. Ongoing planning helps you keep your business on track, understand the bigger picture, and steer your company toward success for years to come. 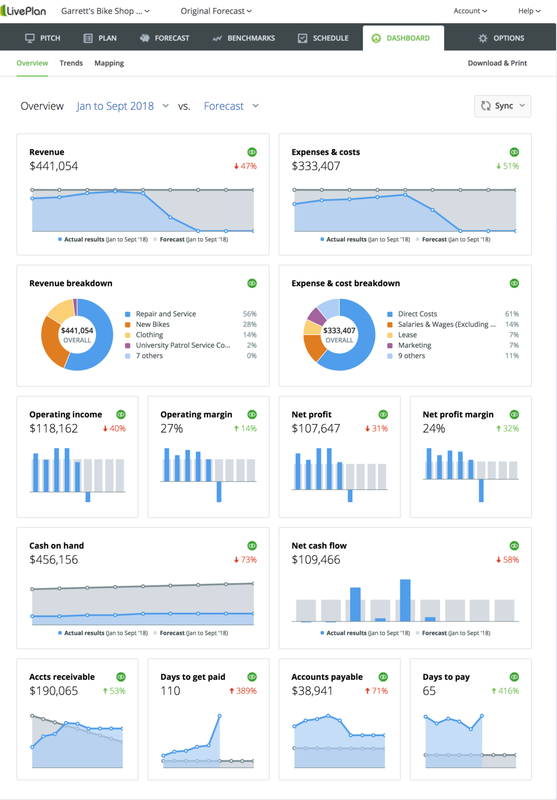 The LivePlan Dashboard displays a set of key financial metrics in real time. Reviewing your plan reminds you of what you wanted to see happen, and looking at your actual results tells you what really happened. The differences between these numbers offer vital insights into the health of your company, and what actions you can take in the coming months to keep things on track. When you can see how your planned numbers stack up against your actual results, you’ll know whether your assumptions about where your business is headed are on target, or totally off. There’s nothing inherently wrong about being off-target with your assumptions, by the way. The key is to recognize it early and update your assumptions. Don’t worry, this is much simpler to do than you may realize. Identify the gap: First, establish the facts. Are your actuals higher or lower than your forecast? By how much? Did this difference happen in a single month, or over a number of months? Investigate: Look at your actual performance for the previous period and the previous year. Are your current numbers wildly different than they were in the past? If so, then something may need adjusting in your business. If your past and present actuals are comparable, then your forecast assumptions may need the adjustment instead. Ask yourself: Look around your business operation, and try to identify the factors that are contributing to the gap. Now, what actions can you take to try and close that gap? Want to see this process in action? Let’s look at two examples of how the Dashboard helps you make better business decisions. Below is a screenshot from the Revenue page of the LivePlan Dashboard, showing revenue numbers for one quarter. The blue line shows the actual revenue, and the orange shows the forecast revenue. Let’s say that this is your business. In your forecast, you had predicted a steady amount of revenue each month. But now you can see that actual revenues changed quite a bit over the quarter, even dipping well below the forecast in the third month. So what’s happening here? Is it a simple seasonal fluctuation in sales, and do you need to adjust your future forecast to represent it? Or is there an immediate problem with sales that needs addressing? Because this business has been operating for more than a year, you have a little more insight available: the two grey dotted lines. One shows what revenue looked like in the previous quarter, and the other shows revenue in this same quarter of last year. So now you have enough information to see that the recent decline in revenue isn’t a seasonal fluctuation. The same decline didn’t happen last year at this time. Clearly, there’s an issue with sales that needs action. Armed with these insights, you can start digging deeper into your business operations: is more marketing needed? Has a competitor made a major change that’s affecting your sales? Have you changed your pricing lately? If your sales team performing? As you can see, the Dashboard has taken the guesswork out of this picture. The comparison of actuals to your forecast and past data has told you exactly where you need to start looking for solutions. Example 2: Why did costs and expenses increase? So your costs and expenses were 20 percent over forecast, but your revenue was 48 percent over forecast. That’s good news–your revenue grew more than your costs! Why might this be? Let’s say you dig into what happened in the business during this month, and find that the pay per click online marketing campaign your marketing manager set up really paid off. She spent more than she had planned, but the return was more than worth it. So now you have some options to consider. Maybe you can talk with your marketing manager about how she might finesse the campaign a bit to maintain the sales growth with a little less spending. Or maybe you’ll decide to maintain the campaign as it is, and adjust your revenue and expense forecasts a little higher in the coming months. Why would you adjust your forecast? This is the beauty of connecting QuickBooks to your LivePlan account. It provides you with the data you need in order to manage your business effectively. As your business grows and changes (or hits periods of slow-down), you’ll be able to see why this is happening and respond quickly. Your forecast is never set in stone. It should shift and change as your business changes. But this doesn’t simply mean changing your forecast to match your actuals. When you see your actual performance against the forecast, it gives you insight into whether your forecast goals were realistic in the first place. And armed with this new information, you can formulate better goals. How much growth can you expect, given the current capacity of your business? How much expense can your business handle and still maintain a positive cash flow? Which of your products are generating the most revenue? Answers to these questions allow you to adjust your forecast over time to reflect your more-informed goals. One last reason the LivePlan Dashboard is so useful: as your company grows, you may need to seek additional funding to help you through expansion. Lenders and investors will expect to see how well your projections have compared to your actuals. You’ll be able to show them any time by running detailed, customizable reports right from your Dashboard. 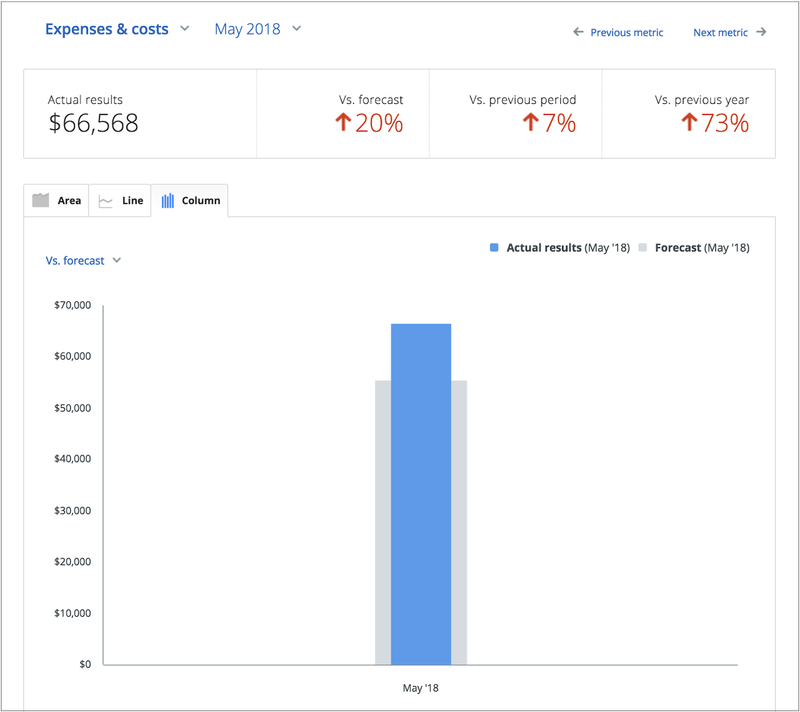 Do two things right now to ensure a healthy business: connect your QuickBooks and LivePlan accounts, and schedule a numbers review each month in your calendar. And if you’d like some help interpreting your data and making decisions, consider working with a Strategic Advisor.